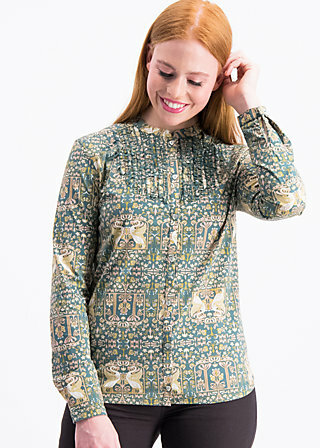 Sleek, long-sleeve blouse made from lightweight cotton- elastane weave with strong patterns for strong women! The colourful blouse with a small standing collar, narrow placket and slightly rounded hem is a timeless favourite for your business and evening looks! The narrow cut is optimised by darts in the back, so you are guaranteed to have a perfect, figure-hugging fit. The sleeves of the blouse feature vents and cuffs, so you can roll them up to lend your formal piece a touch of cool. Loving details: The button placket on the blouse was decorated with small, heart-shaped buttons and vertical ruffles adorn the front above the breast in a charming way. A textile creation that lets you stand with your wife!